I love a good pub. It is my favorite type of drinking establishment. The relaxed atmosphere, good food, good music and a great selection of drinks – there is a reason why I spend WAY too much time at the Burgundy Lion instead of something closer than my apartment. During the Montreal en Lumière festival last month, after going to La Cuvée (an awesome beer, whiskey and retro music event) at L’Eglise Saint-Enfant Jesus, my friends and I walked across the street to Pub Sir Joseph to grab a bite and continue our evening in the right way. 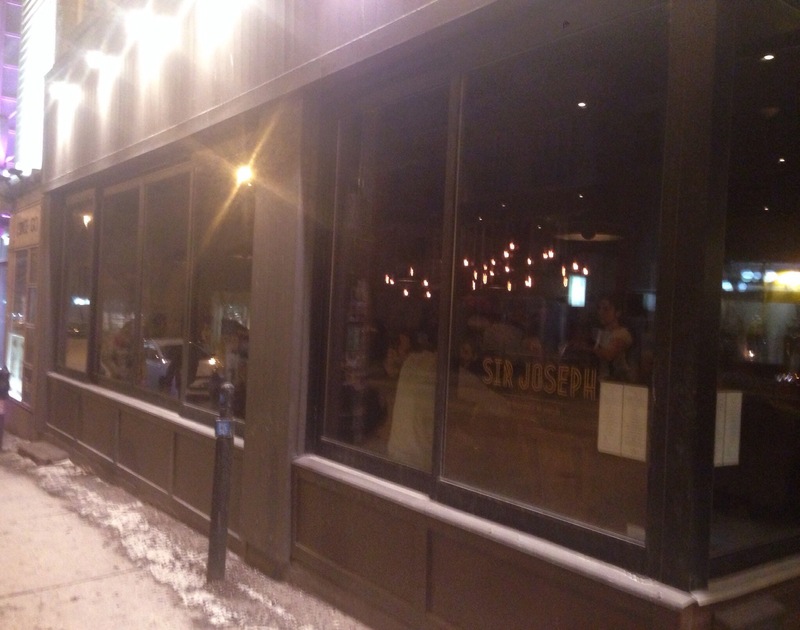 Pub Sir Joseph was opened by a group which included chef Martin Juneau of Pastaga fame and is located along the Main corner St-Joesph in a space which has seen numerous restaurants come and go – the previous tenant was there for under a year from what I recall. So not the most successful location it would seem but Pub Sir Joseph has some positives going for it – A British gastropub is not a common sight in the Plateau and chef Juneau & company’s menu influences is a nice selling point. The interior space has a clean, more sparse vibe than your typical pub – solid wood and stone tables, high chairs and an L shaped bar which is the focal point of the space as it should be. The dim lighting was all candles on the tables with a few pot lights and an interesting lightbulb fixture in the middle of the room. The music was present but not too loud – conversation was actually possible which at a bar/pub around midnight on a weekend has become a big challenge in Montreal. 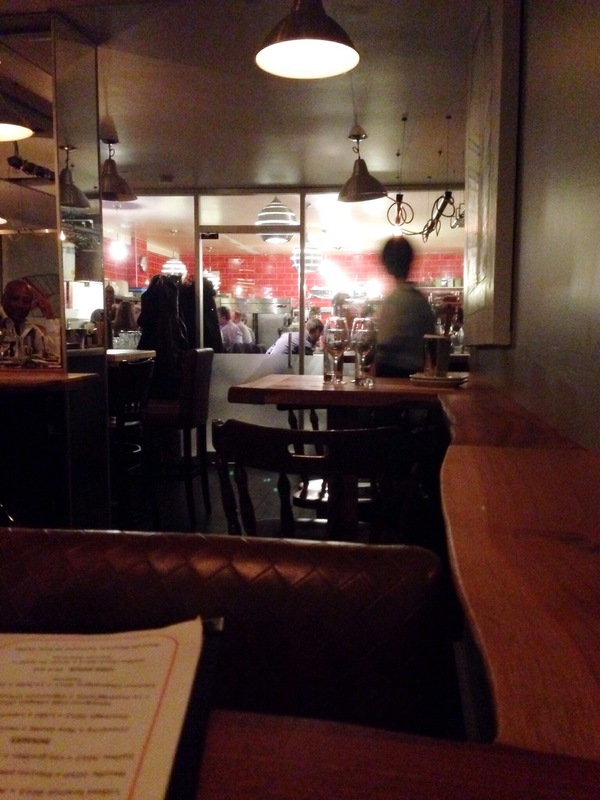 The service was quick and very friendly – to the point where the 2 waiters on the floor would actually start conversations with us a few times over the evening. At first, that level of attention was a little odd – not necessarily a regular occurrence for any of us – but in the end, it was rather endearing and enjoyable. The fact that it didn’t slow down their service was pretty impressive as well. On the drink front, Pub Sir Joseph has a nice selection of local and British beers as well as different cocktails – with a primary emphasis on gin as they have 10 different varieties in house. 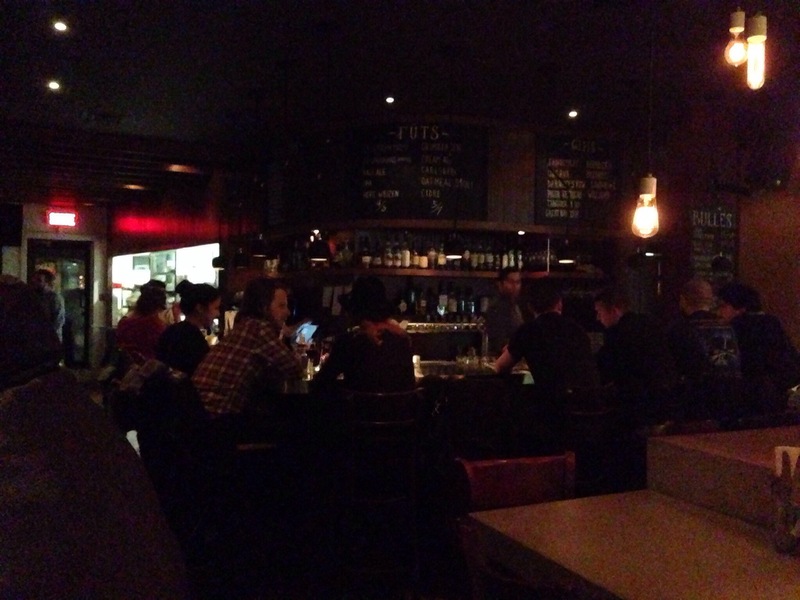 I went with their “Smoky” cocktail – Bowmore scotch whiskey, maple syrup and angostura bitters. 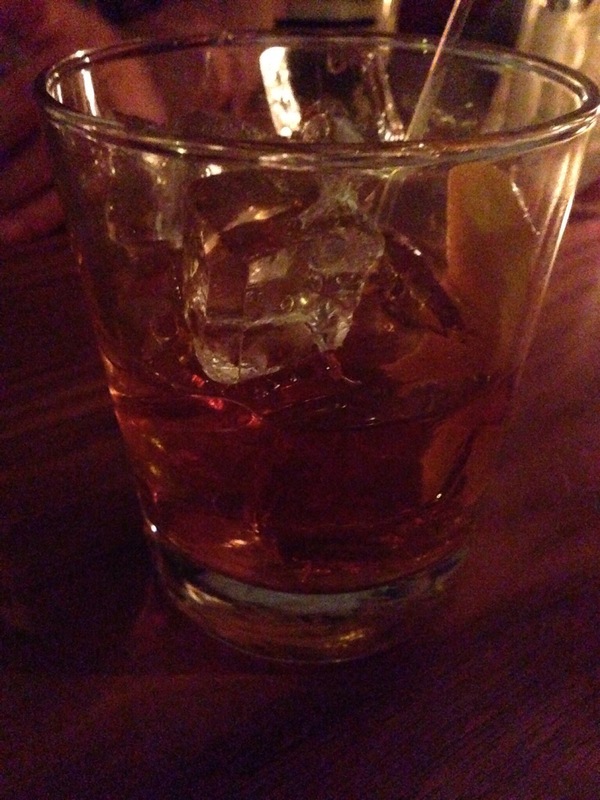 A nicely balanced drink – the sweet maple syrup softened the bitterness and bite of the whiskey and bitters. Foodwise, Pub Sir Joseph focuses primarily on pub-style food in small plate “Tapas” style designed to allow sharing amongst the group as you sit around with a few drinks. Certainly an intriguing concept for a pub-style joint. The menu hits some classic pub items with British and Indian influences, however they definitely are having fun playing off the conventions of the setting. 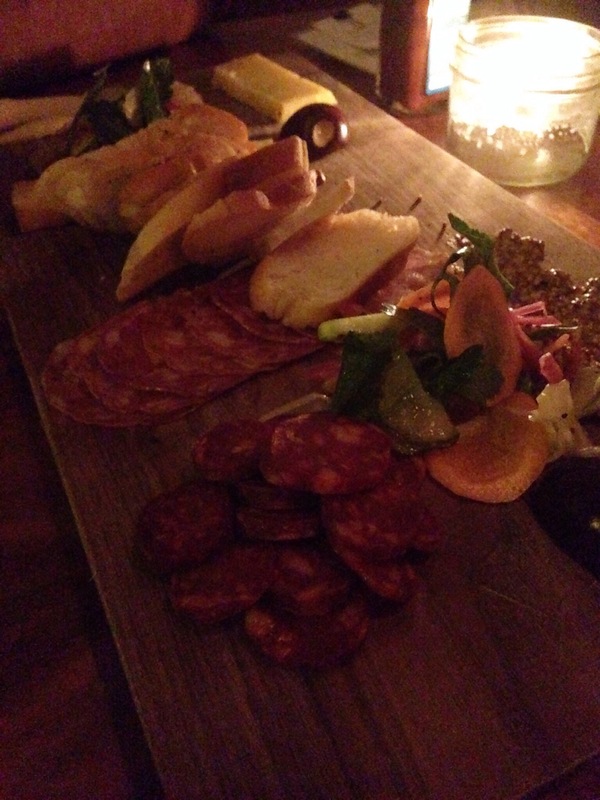 First up, we ordered their Worker’s plate – a mixed cheese and charcuteries dish. Served with some bread and marinated vegetables, there was a nice combination here – chorizo, salumi, cheddar, goat cheese, etc. A nice starting plate. 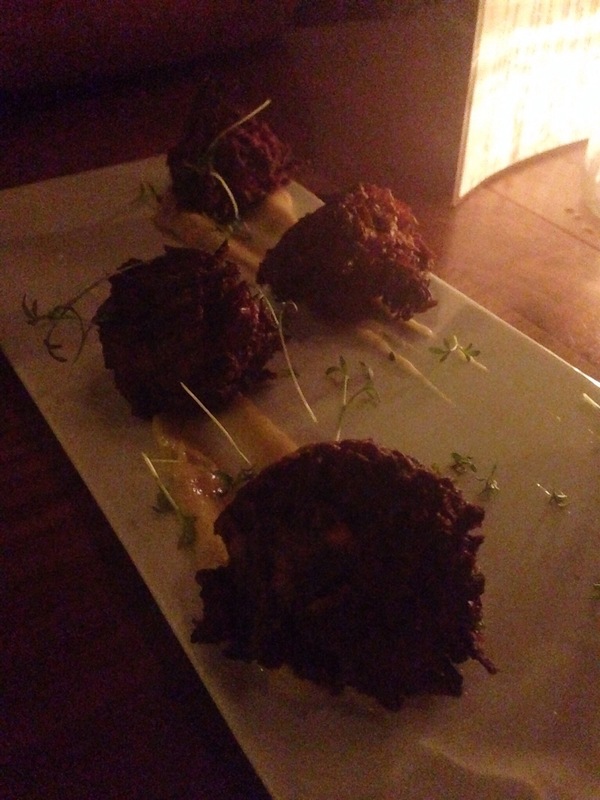 Next up was the Onion bhajis with curry mayonnaise. Bhajis, for those who don’t know, are essentially Indian fritters – in this case done using onions. Inherently sweet due to the onion, they had a nice crunch to them which added something texturally. The curry mayonnaise added some bite without letting the curry become overwhelmed – something that used to bother me until the day I was introduced to true good Indian cooking by some of my University classmates. I only wished they had been more Bhajis on the plate! The final dish we ordered was their Meat pie composed of beef, kidney, braised vegetables and scotch ale. Took some time to reach our table (which our waitress had told us ahead of time) but a solid dish worth waiting for. A nice flaky crust with a rich stewy mixture of beef and vegetables – classic meat pie and a great choice given the evening of drinks we had just had. Our visit here was a last minute call but one that definitely enjoyed. Chef Juneau’s influences on the menu are visible in terms of quality and presentation – as a fan of Pastaga, that is a huge positive for me – and I loved both the variety of Gins and the quality of cocktails available. The service was very smooth and much more personable than I expected. 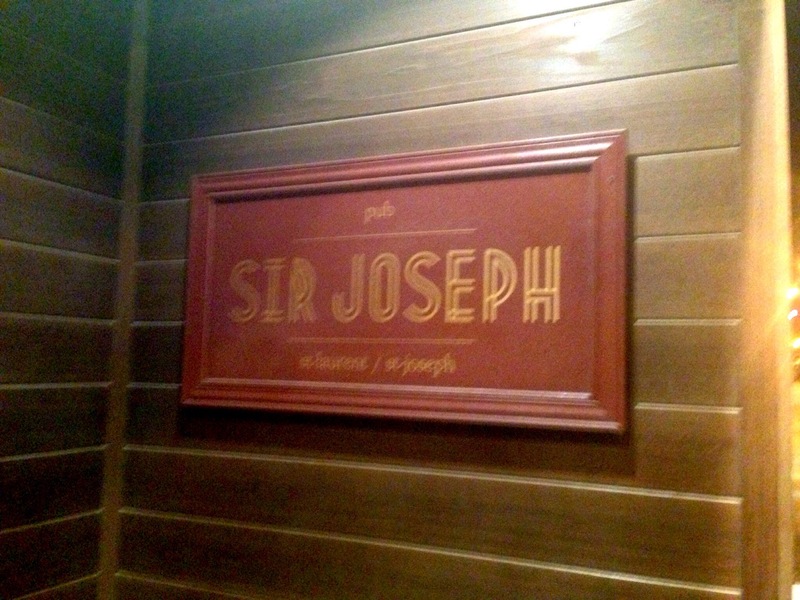 Pub Sir Joseph fills a void in the area and did enough for me in our brief visit to warranted a larger meal as a well as further late night gatherings. For a pub experience, that is really all you can hope for. Over a year ago now, I visited Pastaga for a Sunday brunch and left with the strong feeling of needing to return for dinner. It took way too long but through Taste MTL, I finally did. 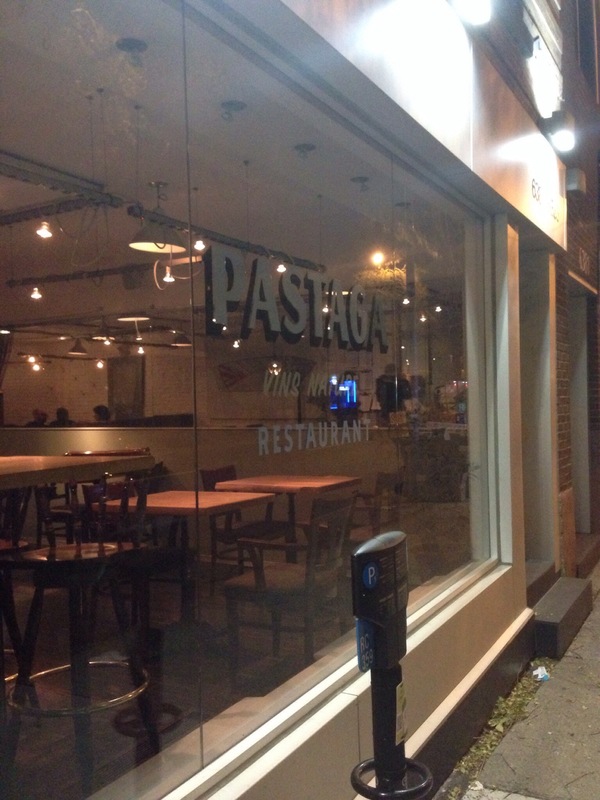 For the uninitiated, Pastaga is the brainchild of chef Martin Juneau who, since opening this restaurant in 2012, has opened up Pub St-Joseph as well as the Mr. Crémieux food truck. 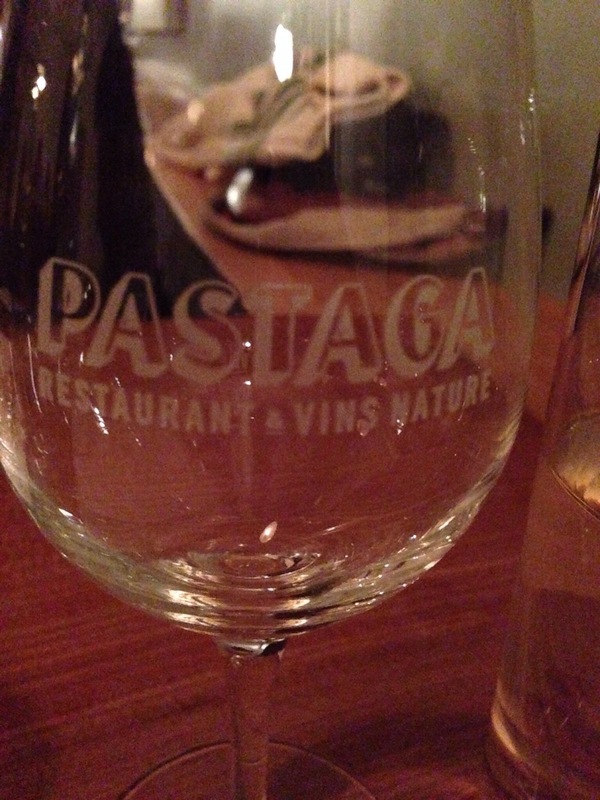 Pastaga is a ode of nature wines as well as great food to pair with those wines. The food definitely has French influences at its core but branches out extensively in other food genres. 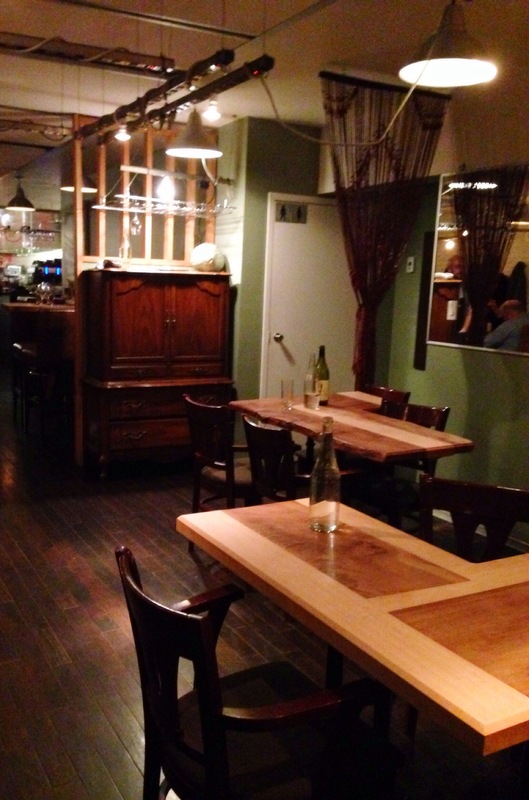 Located on the relatively barren strip of St-Laurent just before little Italy but after Mile End, the restaurant is a small, simple space with mirror walls, misshapen wooden tables and ample lighting via power bars on the ceiling. The real beautiful touch is the bright red tilted kitchen that is visible in the back of the space. A glass wall blocks out the sound from the dining room but we can see everything going on. There is also a large table located in the kitchen for larger groups to enjoy if you can get it. 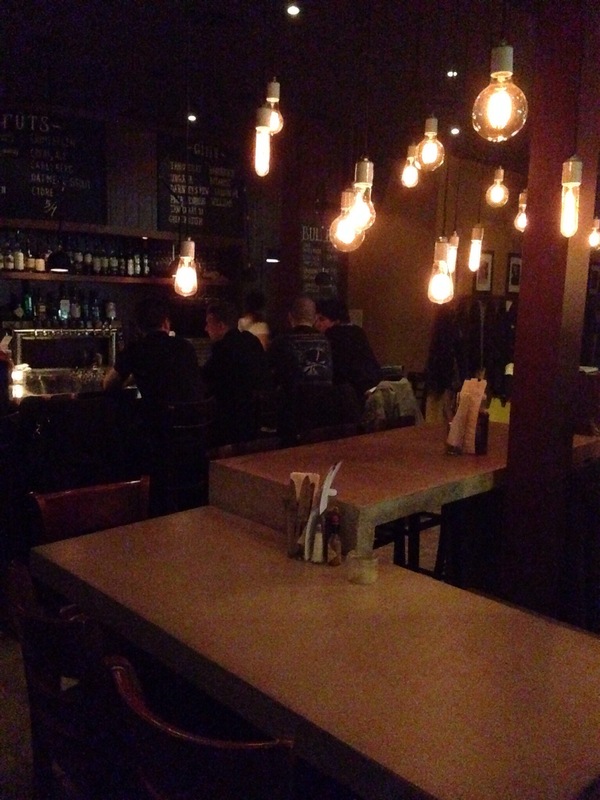 Overall, it is a very cozy and comfortable environment to enjoy a meal in. I visited during Taste MTL where they were offering a 39$ menu of items off their current seasonal menu. Me and my dining companions ordered all of the options to try. 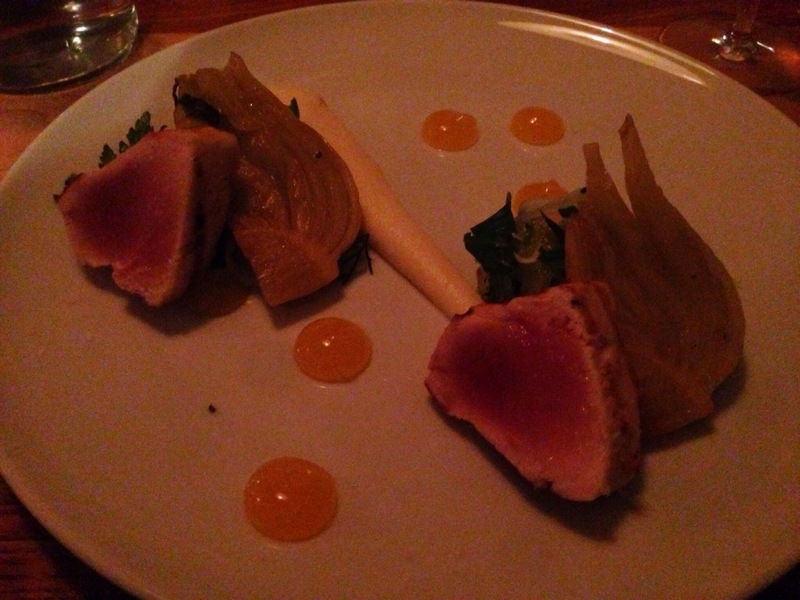 First up, there was grilled Albacore tuna with braised fennel and citrus gel. The tuna was grilled to perfection. The braised fennel and the citrus were perfect compliments to the fish. A very nice start to the meal. 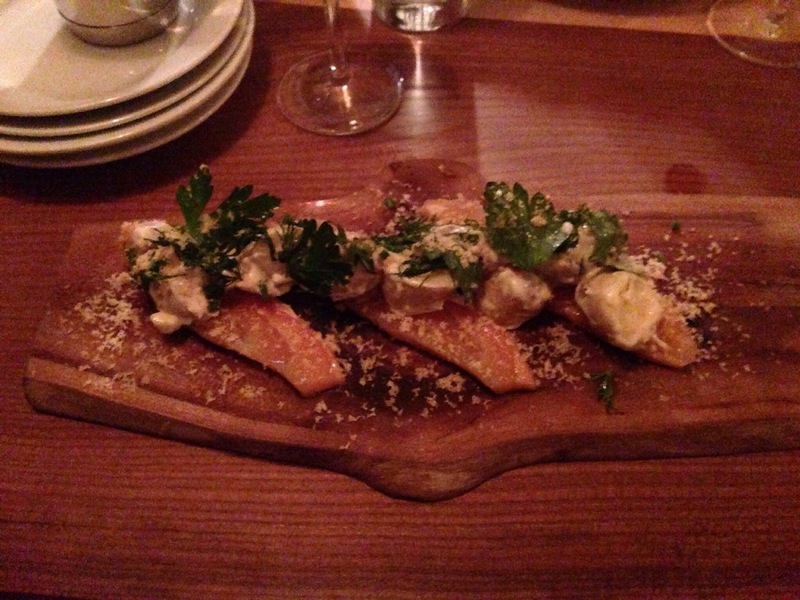 Next up was marinated salmon with salmon jerky and a creamy potato salad. The salmon was, like the tuna, cooked perfectly. The potato salad was, as indicated, quite creamy with a strong hint of dill which paired very nicely with the salmon – bringing to mind a classic smoked salmon dish in terms of taste. 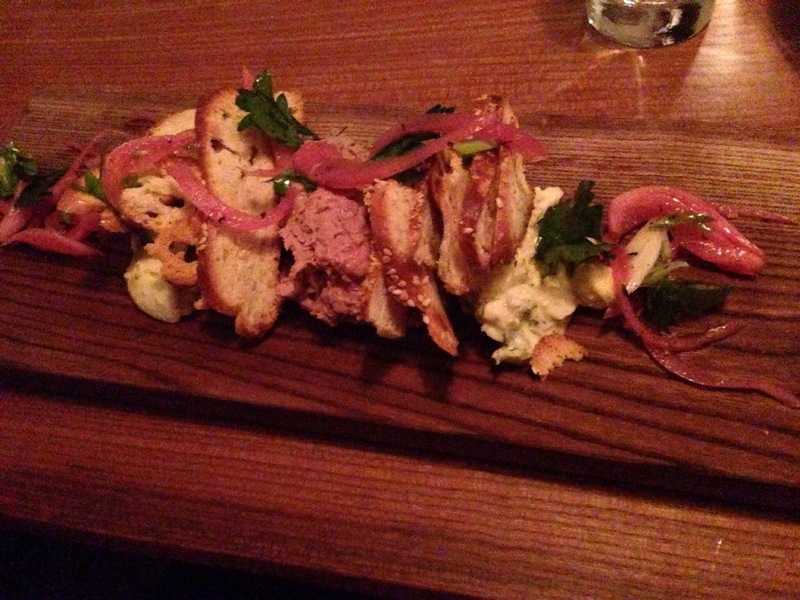 The third main was a play on Jewish chopped liver with bagel chips, capers and hard boiled eggs. Now, I have never been a big fan of chopped liver. Despite my enjoyment of foie gras, the texture of Jewish-style chopped liver always created a roadblock for me. I went in with some apprehension but came out loving it. The texture of the liver was not an issue and had that great fatty flavour. The pickled onions brought some sweetness to that dish. The hard boiled egg was perfect and the bagel chips added that little bit of crunch and saltiness. 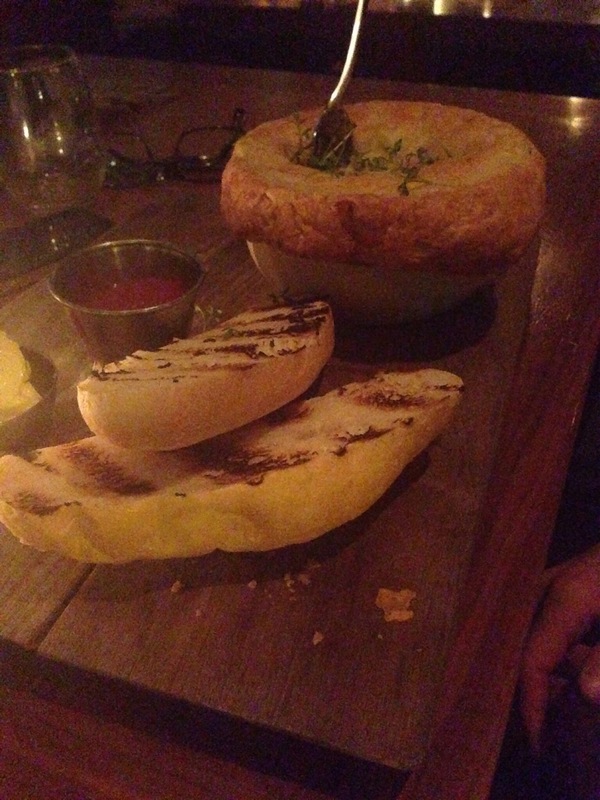 A very well executed dish. 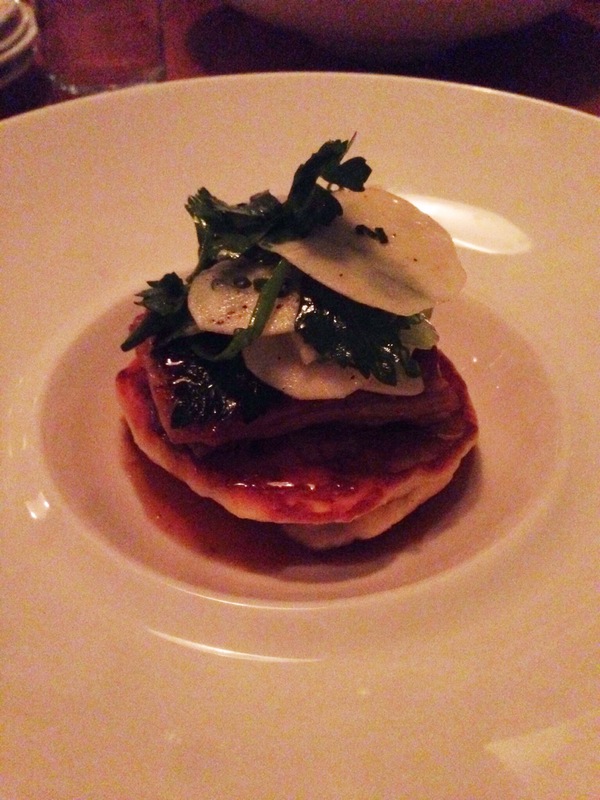 The final main was, to me, the best thing we had all night – maple lacquered pork on a pancake with a parsnip salad. The pork and pancake combination was brillant – the right mix of sweetness, fattiness and starch. The pork, in particular, just fell apart without any effort. Great texture achieved by the kitchen staff there. The salad of parsnip added a little crispness and freshness so you felt a little better health-wise about eating pork, maple syrup and pancakes for dinner! For dessert, there were 2 options plus a cheese plate. 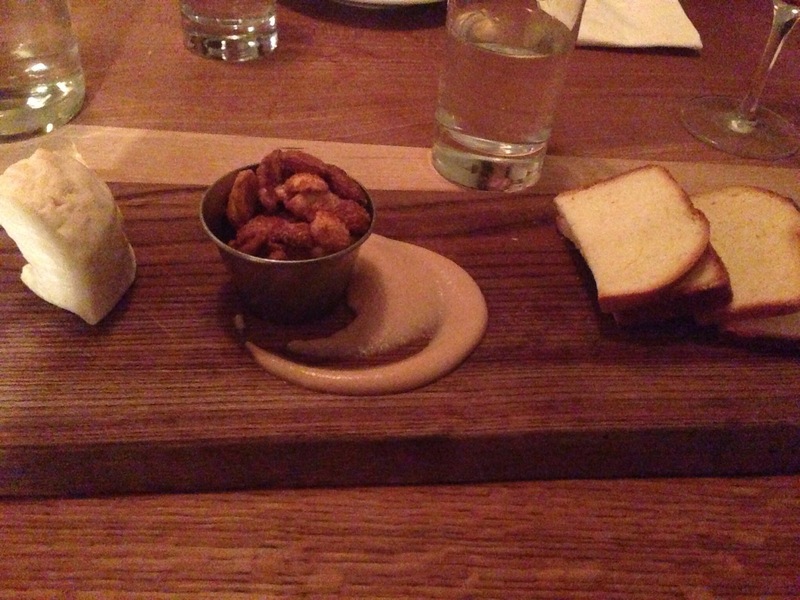 The cheese plate was a goat cheese with candied nuts, apple butter and a mini cake loaf. The goat cheese (I forgot the name of it sadly) was quite good – soft but still firm enough to handle properly. The other 3 elements of the plate allowed you to add different levels of sweetness to pair with the cheese – the apple butter was a particularly wonderful surprise in terms of its strong flavour and consistency. 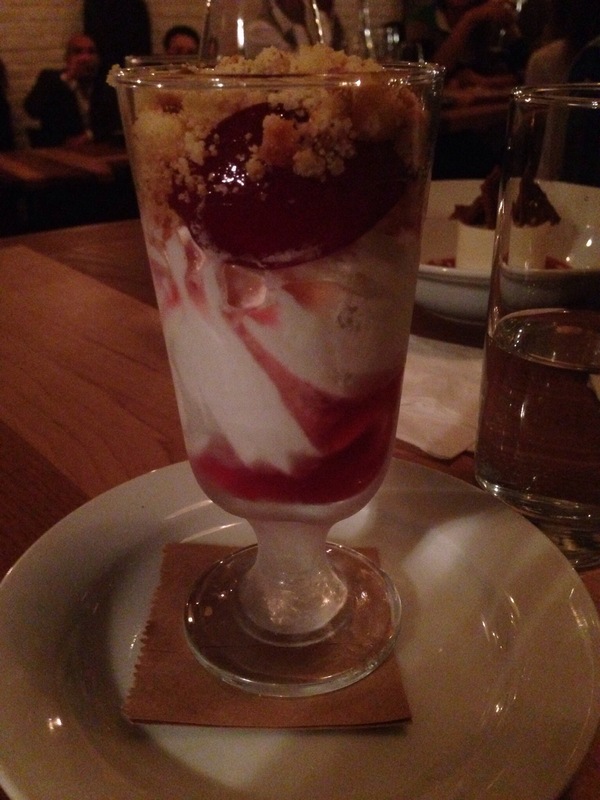 In terms of desserts proper, we had the choice of a Mr. Crémeux Sundae with milk crumble and sous-vide Prunes or a raspberry cheesecake. The sundae was delicious. Anyone who visited the Mr. Crémeux food truck over the summer knows that Chef Juneau and company know how to make a great soft serve vanilla ice cream. The addition of sous-vide prunes provided some tartness and the crumble was nice and crunchy. 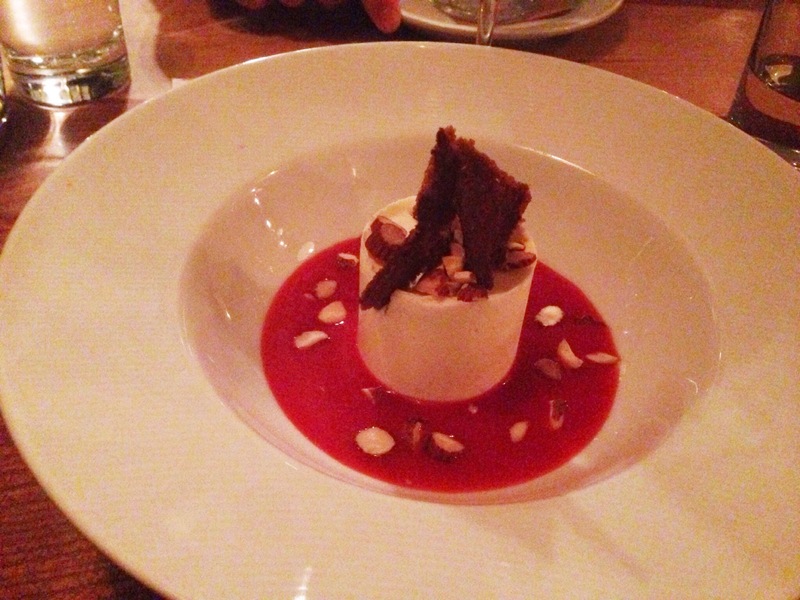 The cheesecake was good as well – the texture was spot-on and the coulis was nice as well. Dinner at Pastaga met all of my expectations and more. Our waiter provided great service especially in terms of the wine pairings for each dish. You could tell he knew his wine list well. The food was wonderful across the board and the dining room itself relaxed and quiet enough to allow good conversation. This meal reinforced the notion that I waited way too long to stop by for dinner. I will definitely not make that mistake again… and I hope you don’t either.